Yet homelessness creates barriers to participation in preschool: high mobility, lack of documentation and transportation, and lack of awareness of homelessness among preschool personnel can prevent homeless children from benefiting from the strong foundation that quality preschool programs provides. Fortunately, the Every Student Succeeds Act (ESSA) amended the McKinney-Vento Act in several important ways to increase access to preschool programs. Below are frequent questions and answers about preschool and homelessness, and links to resources to help implement the new policies. Do local educational agency (LEA) homeless liaisons have any specific responsibilities for preschool children experiencing homelessness? 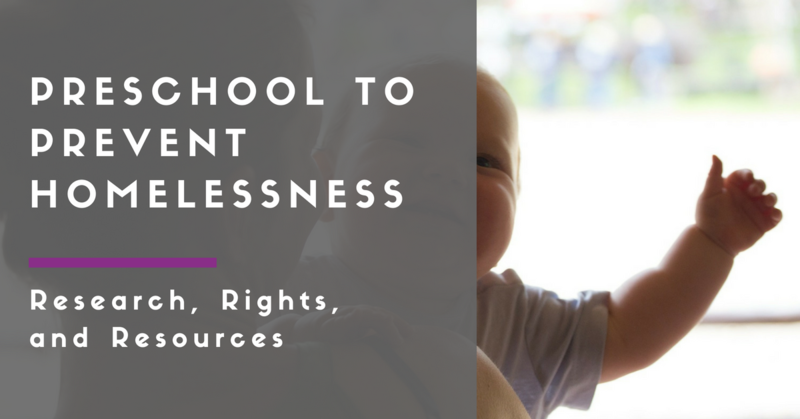 Why is staying in the same preschool important for children experiencing homelessness? For many young children experiencing homelessness, remaining in the school of origin provides their only access to preschool; when children move into a new community due to homelessness, enrolling in a local preschool usually is impossible, either because there are no preschool programs available, or those preschools that are available are full already. The McKinney-Vento Act now includes “preschool” in its definition of school of origin. What does this mean? Which early childhood programs should be considered a “preschool” for McKinney-Vento purposes? Home-based early childhood educational services funded and administered by an LEA. This flow chart provides a guide to apply that definition to an early childhood program. Which factors should LEAs consider in determining whether it is in a child’s “best interest” to stay in the preschool of origin? Under the McKinney-Vento Act, LEAs must presume that keeping the child in the preschool of origin is in the child’s best interest, unless remaining in the school of origin is contrary to the request of the parent or guardian. [viii] LEAs also must consider student-centered factors, including the impact of mobility on achievement, education, health, and safety. For preschool children, the ED Guidance also recommends that LEAs specifically consider attachment to teachers; availability and quality of services in the new area; and travel time. [ix] LEAs must give priority to the request of the parent or guardian. How might LEAs provide transportation to keep preschool children in their school of origin? As mentioned above, the right to remain in the preschool of origin includes the right to receive transportation to preschool (even if preschool transportation is not typically provided)[x], and continues for as long as the child is homeless, and until the end of the academic year in which the child moves into permanent housing. [xi] LEAs are using various strategies to meet this requirement. For example, preschool special education buses often are not full and can accommodate additional children without disabilities with minor variations in routing. LEAs may wish to explore the use of special education preschool buses to provide transportation to McKinney-Vento preschool students. According to the U.S. Department of Education, special education buses can be used to transport McKinney-Vento children without disabilities, as long as no additional IDEA funds are used to transport those students. In addition, LEAs may wish to budget for transportation for McKinney-Vento preschool children as a use of their homeless reservation under Title I Part A. Are LEAs required to enroll children experiencing homelessness in preschool programs immediately? Under the McKinney-Vento Act, LEAs must enroll homeless students immediately, even if students do not have required documents, or have missed application or enrollment deadlines during any period of homelessness. [xii] Therefore, if a preschool program has space, children experiencing homelessness must be enrolled immediately, even if they have missed an application or enrollment deadline. In order to ensure that preschool programs can accommodate children experiencing homelessness who come into the area after the enrollment period, LEAs should allocate and hold open slots for such children, or prioritize them on wait lists. LEA liaisons should help families experiencing homelessness enroll in preschool programs as early as possible, as these programs often begin enrollment well before the start of the school year. Does the McKinney-Vento Act apply to Head Start programs? The McKinney-Vento Act applies to Head Start programs that are administered by LEAs. [xiii] In addition, all Head Start programs must follow the Head Start Program Performance Standards. These standards include specific provisions on homelessness that are aligned with the McKinney-Vento Act. Are children experiencing homelessness automatically eligible to attend preschool programs funded under Title I? [vii] [E]arly childhood education programs for children aged 0-5, funded through tax dollars or other public funds, and for which the LEA is a financial or administrative agent or for which the LEA is accountable for providing early childhood education services.” Examples of preschool programs included in federal data collection include preschool programs operated or administered by an LEA; Head Start programs receiving funding from the LEA or for which the LEA is the grant recipient; preschool special education services, operated or funded by the LEA or mandated under the Individuals with Disabilities Education Act; preschool programs and services administered or funded by the LEA through the use of Title I or similar government grants; or home-based early childhood educational services funded and administered by an LEA.” National Center for Homeless Education (2016). Guide to Reporting Federal Data. nche.ed.gov/downloads/data-guide-15-16.pdf. [ix] U.S. Department of Education, Education for Homeless Children and Youths Program Non-Regulatory Guidance, N3. [xiii] U.S. Department of Education, Education for Homeless Children and Youths Program Non-Regulatory Guidance, N5 and N5. [xiv] U.S. Department of Education, Education for Homeless Children and Youths Program Non-Regulatory Guidance, N2.